We have Elderberry plants for sale and it is time to get them in the ground now! Our Oklahoma winery and vineyard features dozens of handcrafted fruit and berry wines, produced here from our apples, pears, chokecherries, elderberries, sumac and peaches along with our own special fruit blends and classic grape wines. Our more traditional Merlot, Cabernet Sauvignon and Chardonnay wines are a real bargain and all made right here in Creek County, Oklahoma. Come out and see the whole winemaking process; learn how we are turning this year's crop of Oklahoma wine grapes into premium vino! You can even pickup some winemaking supplies and advice to create your own wine. Winery hours are 12:00 p.m. to 5:00 p.m. Thursday though Monday. Unfortunately, we are still NOT able to put on the wine festival that we have had for 16 years. We started in the fall of 2000 and became unable to continue in 2018. However, we will be pouring our wine at the Tabouli Festival in downtown Bristow in May. They have a great festival that they have been having for several years and we are happy to be freed up so we can join them this year. We will have a wide assortment of wine, so hope you can attend and join in with the festivities. If you want to preorder cases, Pete will be glad to accommodate or you may stop off at the winery after you taste to pick up more wine. If you have any questions, please don't hesitate t call 918-756-7568. If we don't answer, please leave a message. We will call you back. Visit our farm and vineyard with its winery and tasting room, wine sales area, and gift shop. We are located in Northeastern Oklahoma's scenic Green Country near the village of Nuyaka, the Deep Fork National Wildlife Refuge and Dripping Springs Lake. Some folks even come out to paddle our local river! Explore the wine grape growing information and wine tasting resources on this site, then visit the winery. Our vineyard manager and master vintner (Pete Jones) should be on hand to answer all of your questions. Although, we occasionally attend Oklahoma wine tasting events around the state, your best bet to taste our entire selection is to drop by for a visit. 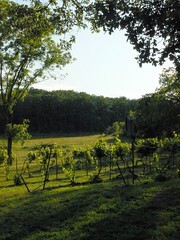 Come on out...taste any wine we have available and buy a few wine grape vines for your own personal backyard vineyard. Our Oklahoma merlot vines are the perfect addition to any landscaping effort. Nuyaka Creek Winery is located in southern Creek County Oklahoma, on the Creek / Okmulgee County line (winery map). Spring WineFest - Third Saturday in May. Harvest Festival - Third Saturday in September. Own the Nuyaka Mall - A ready-made home and rural business in Oklahoma's Green Country. Includes large herd of hummingbirds. Come out and taste a rich variety of classic Oklahoma wines and unique specialty vintages. Our weekend wine tastings always include a unique assortment of Oklahoma wines, the widest variety in the area! This is award winning Oklahoma wine, all produced and bottled on location in Nuyaka, Oklahoma. Mix-Your-Own case of 12 Nuyaka Creek Wines for $100! Visit Thursday - Monday on your way to or from Okmulgee State Park and Dripping Springs Lake. The Deep Fork River and wildlife management areas surround us and the historic Nuyaka Indian Mission is located two miles East. Come witness the birth of a vintage Oklahoma industry! Learn more about fun attractions in Oklahoma's Green Country at GreenCountryOK.com! Winery Picnic area available (see our Pictures page)...your kids & pets are welcome every weekend! We are open all year around. Take time for a fun and romantic road trip this weekend! Call us for directions at 918-756-7568, if you need to. Send us your input via email to make this winery great! how you can cash in on this growing Oklahoma wine industry by growing wine grapes for profit!